Over her three decades as a nurse at Fox Chase Cancer Center, Pam Jakubek, RN, MSN, has worked plenty of shifts over holidays, caring for patients while her family — and often theirs — waited at home. “As much as I wanted to be home, especially when my daughter was younger, I sometimes worked on holidays because I knew that my patients needed the same care no matter the date,” Jakubek said. In 2012, Jakubek, who specializes in wound and ostomy care for both inpatients and outpatients, became a patient herself and gained a greater appreciation for the notion that cancer doesn’t take any days off. In late October of that year she was newly diagnosed with breast cancer, and was receiving chemotherapy as Superstorm Sandy, the largest hurricane ever recorded in the Atlantic Ocean, caused havoc outside. As if enduring an infamous hurricane while going through chemotherapy wasn’t enough, later that year Jakubek would learn firsthand what it meant to patients when she and her colleagues worked in the hospital over holidays. On December 24, she suffered an anaphylactic reaction after the second dose of her second round of treatment, and was admitted to the hospital. Since her diagnosis she had maintained a work routine as close to normal as her treatment allowed, and her fellow nurses had rallied around her, sending someone to clean her house, helping with grocery shopping, and handling meal preparation for her family. Now Jakubek would need them even more, and their response was overwhelming. Jakubek’s situation on Christmas Eve activated the hospital’s Rapid Response team, bringing in a full staff on a normally slow day. 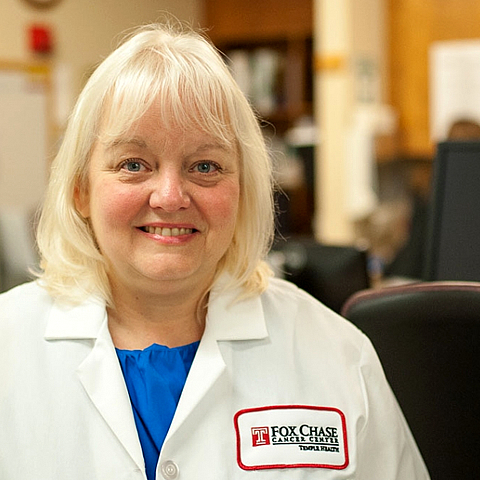 Although it was a holiday, Jakubek received the same high-quality care she would have received on any other day, and she was deeply moved by the response of the entire Fox Chase community. “As soon as I was stable I had a steady stream of visitors throughout that day and night, and not just the medical staff,” she said. In addition to her closest colleagues, she was visited by, “department heads, executives, housekeeping staff, nurses from other units, doctors from other floors – all of them came to check on me and make sure I was alright at a time when many of them could have been spending Christmas with their families.” Several people came to the Center when they heard she was in need, and some stayed even when it became clear that she would recover. Jakubek woke up in the hospital on Christmas morning determined to be well enough to be discharged. The nurses who were working that morning rallied around her once again to ensure she could go home, and they succeeded.